Peter Webster portrays the life of Nikolajs Kampars, editor of BDG Magazine, and chess players Nick Kampars met along his journey from Latvia to Wisconsin in a story that is well worth reading. He drew Bobby Fischer in a Caro-Kann Defence below. "This information comes from two visits to Nikolajs Kampars at his home and one with his family after his death. When I met Mr. Kampars, he was living with his wife and sister in the lower portion of a Victorian-era home in Milwaukee. A brother lived nearby; I do not know if there were other living relatives. He had heart trouble and had retired from his work in a bakery. "In Latvia he had been a member of the judicial system. I was not able to work out which position in the United States would have been most comparable to the one he held. His father had been a police chief in Russia during the Czarist regime. One of the few things which the family had brought with them when they escaped from Latvia was an oil painting of their father in dress uniform; this was hanging on the dining room wall. He told me that once he and his brother entered the police station and found the entire staff asleep. It was the custom in those days to have waxed mustaches with the ends curling upwards, and the two boys were unable to resist the temptation to clip the ends off those mustaches! "When Soviet troops entered the Baltic states. thousands of people fled. For the Kampars family this was a life-or-death decision; the Soviets were under orders to eliminate anyone who might be antagonistic to the Communist regime (I have read an estimate that eleven thousand Latvians were murdered and thousands more deported to Siberia), and as the family of a Czarist police official they would have been on this list even though their father had died between the World Wars. Some Estonians were able to enter Finland, with which there was then a common border, but Lithuanians and Latvians had nowhere to go but German-controlled territory. The family was fortunate to reach a camp in Austria, which was not overrun by the Soviet armies. "All I learned of his chess life in Latvia is that he and his brother were given lessons by Aaron Nimzovich and that at one point he was the librarian for the national organization. The book Alekhine in Europe and Asia (Donaldson, Minev, and Seirawan) includes a simul loss by Alekhine in Riga, Latvia, against "Kampar" (see p. 98); no initial, and the final "s" is missing, but this may well have been Nick Games from a tournament held in the Austrian DP camp indicate that he was a conservative player with a classical style and opening repertoire; the gambit ideas for which he became known when he published Opening Adventures were not typical of his crossboard play. He became one of the best in Wisconsin using this classical style; before I began to play tournament chess he drew against a very young Bobby Fischer as Black in a Caro-Kann, (he also lost one to Fischer) and my records show that in the 1958 North Central Open in Milwaukee (Pal Benko headed a field of 88) he was the top Wisconsin player (4-1,2) and repeated this in the 1959 Western Open (4-1,3) (Benko again, 112 players) and 1959 North Central Open (4-0,3) (master Curt Brasket of Minnesota won ahead of future world correspondence champion Hans Berliner, 90 players, Kampars 5th). I don't know whether he ever competed outside Milwaukee. His USCF rating was Expert. "I do not know how Mr. Kampars became aware of the German master Emil J. Diemer. The family participated in European chess life to some extent. His sister told me that GM Savielly Tartakower wrote a poem for her! He would occasionally send the aging Diemer a little money when he could spare it; he showed me a strange letter which seemed to indicate that Mr. Diemer had some sort of mental glitch, although he noted that other letters gave no indication of problems. "Although I did not see a pet in the home, copies of the bulletin of the Milwaukee Society for the Prevention of Cruelty to Animals were on the sideboard. Appropriate reading material for a gentle man and gentleman." Thank you for that wonderful piece! The USCF Master Peter Webster is a long time Blackmar-Diemer Gambit player whom I mentioned in the Introduction to my BDG books. 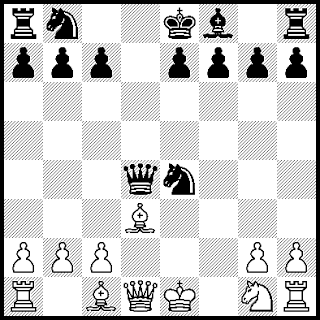 Here is a Caro-Kann Defence that Nick Kampars drew Bobby Fischer. In slow grandmaster tournaments, opening traps are rare. But in blitz, club, and online games we see traps all the time. 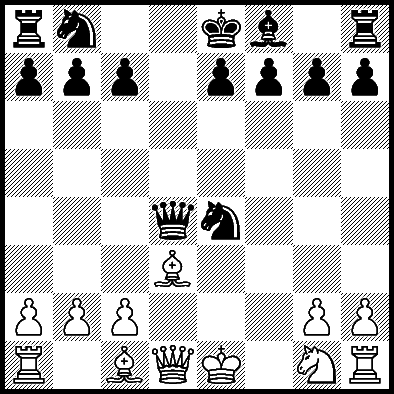 The Blackmar-Diemer Gambit can be declined with 4.f3 Bf5 known as the BDG Vienna. The most common continuations are 5.g4 Bg6 or 5.fxe4 Nxe4. If Black takes with the bishop by 5...Bxe4, a trap winning the queen is playable. All Black has to do is to see a hanging d4-pawn in the middle of the board and grab it. Blitz players fall for it, as my opponent did in our two-minute bullet game below. This same simple trap can also be found in the BDG Euwe variation. It works!